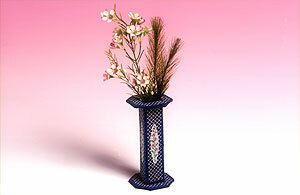 Designed as a companion piece to the dark blue rosebud box, this vase has a similar design but is lined with felt, rather than evenweave, to prevent flower stems from catching in the stitching. It may be used to display silk flowers, but would also hold a narrow container of water, such as a test tube, for natural flowers. This design uses only full cross stitches and backstitch. There are no fractional stitches or french knots.